This Valentine’s Day, come see why even dating services send their clients to The Rise Eatery. Enjoy a special 5-course prix fixe menu in our romantic dining room on February 14th. Don’t miss out on a memorable experience this Valentine's Day! Please note our regular dinner menu will not be available during this time. We apologize for any inconvenience. Join us for our annual Kick-the-Blues event beginning Tuesday, January 15th to Sunday, February 3rd! Enjoy a limited-time 3-course prix fixe dinner menu at $30/person featuring some elements of our most popular menu items. Wine pairing also available at $25/person. “The most wonderful time of the year” is approaching, and we’re excited for all the celebrations that will be taking place at The Rise Eatery! View the special menus we have for this holiday season and contact us to find out what a holiday party is like in our dining room. Reserve early to avoid disappointments! The Vancouver Foodster 3rd Sangria Challenge was a huge success featuring sangria creations from restaurants around Vancouver. Each restaurant featured their sangria creation from September 13 – October 7, 2018. . Our media judging panel determined the ultimate winners of the challenge, and this was quite the task as each judge who tasted each creation with a rigorous process based on taste, originality/uniqueness and presentation/appearance. In a city as diverse as Vancouver when it comes to food, it comes as no surprise that we boast great options for fusion eats! While burrito sushi rolls flooded the gram in 2017, the following eateries take a more sophisticated approach to creating unique and exciting pairings that pay homage to cultures from around the world. A swanky little joint on South Granville, The Rise Eatery pairs the most unlikely of ingredients to create dishes that not only look good but that actually taste delicious. Order: Chef Dan’s Wheel of Nosh, eight pieces of fun hors-d’oeuvres served on a mini Ferris wheel. Be kind to our ocean. No more single-use plastics. Just doing our part to reduce plastic waste. Effective immediately, we will not be giving out straws with our beverages nor utensils with our takeouts. The plant-based products we have been using will still be available upon requests. Please join us in protecting our ocean. It’s official, The Rise Eatery is one year old! And what better way to celebrate a year of culinary exploration than with a signature cocktail that once again sails beyond the boundaries of our craft? On those tough days when you’re craving an escape from the bustle of the city you can make your fantasy a reality with your first sip of the Castaway. Just in time for summer, we’ve set out to channel the serenity of soaking up sun on a secluded island in a cocktail. The Castaway is a tribute to all things tropical. Coconut rum provides the sweet and boozy base of this cocktail while Bitterhouse Daman brings a balancing grapefruit tartness to the mix. A squeeze of lime brightens up this deep blue abyss and to bring out just a hint of the salty ocean we add a dose of olive brine. A natural mix of butterfly pea flower lends the Castaway its beautiful ocean blue color. We then layer the lapping waves with a shake of pineapple foam, and finally crown it with a house-pickled pineapple skewer. We couldn’t resist including a juicy treat before diving into this luxurious tropical escape. The aroma of an island campfire greets you as your cocktail arrives on a torched plank, and it looks as though you’re not alone in your tropical seclusion. Each Castaway comes with its very own message in a bottle. What will yours say? Tag us on Instagram and Facebook to let us know! Escape to your very own island retreat in the heart of South Granville and join us in celebrating our first birthday with the Castaway. No one works harder than Mom. And to give her a break we’ve designed a cocktail especially for her. Exclusively available this Mother’s Day weekend is The Momosa. At the base of the cocktail is a new favourite of ours, Bitterhouse Daman. This craft aperitif (distilled in British Columbia) adds it's bittersweet grapefruit flavour to the mix. This libation wouldn’t live up to its name without sparkling wine, so we top it off with brut Cava. Our thanks go to Davids Tea for their Strawberry Rhubarb Parfait tea. Simmering this bright and fruity blend brings forth aromas of wild berries. Once chilled, we combine a generous pour with a splash of fresh lemon juice to enhance the mix of grapefruit and Cava. And, of course, each Momosa is garnished with a heart-shaped orange twist. Crisp bubbles and ripe summer flavours make this cocktail perfect for toasting to Mom. Celebrate her day in style this weekend at The Rise Eatery. The Rise Eatery Tucked within a section of South Granville known for posh boutiques and furniture shops, is a welcoming, sun-drenched deck at this nouveau Asian eatery. Creative share plates, brunch, and tasty cocktails are made for sunny day fare. When someone tells us it's going to be something different, we are usually skeptical - is it really going to be that unique? Be Sure Mom Gets Treated Like A Queen This Mother's Day! Spring is in full bloom and summer is fast approaching. With that said, let us suggest a cocktail we created with the new and improved weather in mind, the Cardinal Sin. The cocktail’s name is a nod to Matt Cardinal, the bartender to write the recipe here at the Rise. The ingredients pay homage to a few family traditions at his childhood home in Ontario. The primary inspiration for this drink is homemade strawberry-rhubarb pie. Their family recipe made use of fresh strawberries and rhubarb grown in their backyard garden. To incorporate those flavours into a cocktail Matt brewed a strong batch of strawberry rhubarb tea (by Davids Tea) and added sugar to create a syrup thats tastes less like tea and more like dessert. The second source of inspiration for this drink is the base spirit. At the Cardinal house, celebrations call for tequila. Although they make their own wine and enjoy everything from rye to sambuca, a summer night under the stars is never complete without a toast with tequila shots (with lime and salt, of course). To make a Cardinal Sin we shake Espolon tequila with our strawberry-rhubarb tea concentrate, lime juice and lots of ice before straining the mixture into a coupe glass with a salt rim. The Cardinal sin, served straight up, is a sweet combination of flavours that screams summer. With brighter, warmer weather upon us, it's time to bring family and friends together for a cocktail on our cozy, newly re-opened patio. This week we present a house cocktail that’s been a staple on our drinks list since day one at the Rise, the Geisha-Rita. Given it’s unique presentation and taste, the Geisha-Rita has staked its claim as a guest favourite in our dining room. If it isn’t our top-selling beverage, it is definitely the most-instagrammed. Lychee liqueur and sake are shaken vigorously with ice before a loose strain provides a frosty alcoholic base to this new classic. The mixture is then topped with Fentimans rose lemonade to bring the sparkle to this effervescent and floral concoction. Finally, a crescent rim of togarashi adds both heat and color. Every classic cocktail needs a signature garnish and The Geisha Rita is no exception. We finish this potion off by adding a fresh lychee that’s skewered with a Pocky stick, a dose of sweetness to begin or end your cocktail experience. A tribute to our Asian influences, both traditional and modern, the Geisha-Rita is the liquid incarnation of our culture here at The Rise Eatery. Step right up to the magical foodie carnival! Well, it may not be an actual fair, but it’s got a pretty playful presentation. The Rise Eatery’s one-year anniversary is approaching, and while this South Granville spot specializes in contemporary Asian fusion cuisine, it has garnered attention for one dish in particular on its menu – the Wheel of Nosh. The Bee Sting is one of several new additions to our cocktail menu for Spring. Like so much of our menu at The Rise, it’s a carefully crafted balance of bold flavours. What makes the Bee Sting unique is the competition between spice and sweetness on the tongue. Limoncello, Honey and a dash of lemon juice provide the sweetness necessary to tame the tingling heat at the base of the cocktail, Sons of Vancouver Chili Vodka. There’s simply no alternative to Sons of Vancouver Chili Vodka. Distilled in “really really small batches” in North Vancouver, the spirit packs a punch of 180,000 Scoville units, leaving lasting, flavourful warmth on the palate between sips. After shaking and a fine strain, this martini is garnished with a gorgeous freeze-dried honey chunk that, when dipped in the glass, can add just a bit more sweetness to soothe the chili’s sting. A Bee Sting glows like honey under bar lights and is sure to spice up any occasion at the Rise. Vancouver! Here are your #LaPoutineWeek 6th Edition Winners! There’s no room for faux pas when showing your love and admiration on this very romantic day of the year. Details matter and you do want to impress! Fun, love, beauty, charm, excitement, flame, passion, tenderness, sweets are all “ingredients” used to craft our Valentine’s Day menu. Don’t miss out on a memorable experience on February 14th at The Rise Eatery! This RAMEN POUTINE from The Rise Eatery is everything! Anyone else got a case of the post-holiday blues? All that classic Vancouver wet weather doesn’t help either. We’re doing something about it! No, we can’t stop the rain but how about a night out with a delicious, value-added dinner that won’t break the bank? From January 19th to February 4th, The Rise Eatery will offer a special 3-course menu for two at $30/person, compare to $50/person regularly. 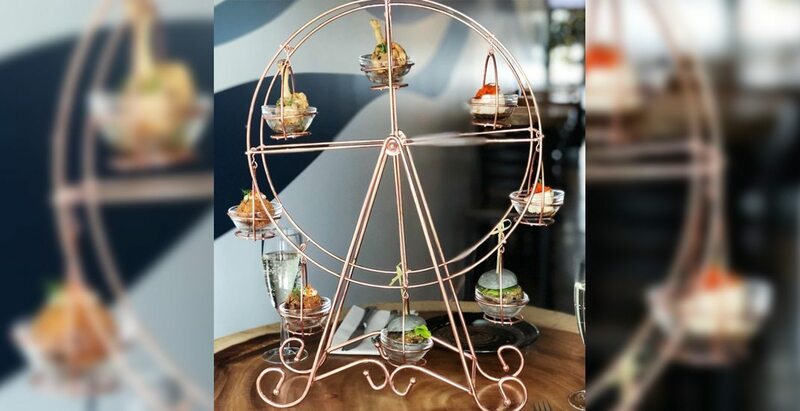 This limited-time menu includes the infamous Wheel of Nosh – creative hors d’oeuvres presented on a beautiful table-top Ferris wheel! Wine pairing is also available at $25/person. Reservations are recommended. Now that Christmas is over, time to relax and enjoy some well deserved time off with friends.. and an egg nog cocktail (obvs). The holiday season is creeping up on us but no need to panic. The Rise Eatery is excited to present you with our very first holiday season. Chef Dan Leung has designed some festive set menus for all your holiday gatherings. Whether you have a large group and are interested in a buyout or you’re planning on an intimate get-together during the holiday season, The Rise Eatery is a choice that will make you “sparkle” as the party-planner! With a focus on beautifully-presented, globally-inspired dishes served in a stylish yet comfortable space, our team will help create holiday memories that you will cherish. Our entire space can comfortably accommodate up to 50 guests for seated dinners or 70 guests for cocktail receptions. We have a beautiful reception area for greeting, a bar area for mingling, a spacious room for dining and finally a romantic back patio for breathing fresh air in! Can’t wait to have your and your guests join us this very special time of the year. These menus are available starting on November 14th, 2017 for parties of 6 or more. Reservation required 2 days prior. Start planning your holiday good times, and keep in mind that we will be open at regular operating hours throughout the season except for Christmas Day, December 25th and New Year’s Day, January 1st. To celebrate Oktoberfest, we are offering a complimentary Bavarian pretzel & IPA mustard with each sleeve or pint of any of our delicious draught beer everyday after 5pm for the month of October. Cheers!